Traveling with a number of iOS devices presents a new, first-world problem: Keeping everything charged. While not perfect, Kanex has a solution. As part of their GoPower series of chargers, they are introducing an Apple Watch battery pack charger. 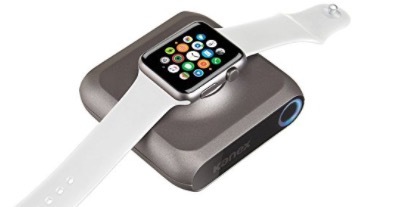 It includes a magnetic induction pad just like the one on the Apple Watch charging cable. Before you go on a trip, plug in this device and charge it up. Later, you simple place your watch on the battery pack, press a button, and it begins charge wirelessly. Unfortunately, the watch’s Nightstand Mode doesn’t work in this orientation. The charger is Apple MFi Certified. It has a ring of four LEDs that indicate the amount of remaining battery power—100%, 75%, 50%, 25%. In my testing, I got three full charges and one 50% charge from the unit, enough for a long weekend away without bringing along the Apple Watch charger. As an additional benefit, you can charge your iPhone via the built-in USB port. I got nearly three full charges with my iPhone 7. A full charge takes about 2.5 hours. Built-in pass-through circuitry allows you to plug the charger into power while charging your devices. This way, you can top up the battery pack as well as your watch and iPhone simultaneously. Priority is given to your devices first; the battery pack charges afterward. A Lithium Polymer battery is used in this device. It has a 4,000 mAh capacity which is fine for the watch, but it seems a bit meager for charging iOS devices. The plastic battery pack measures about three inches square and is an inch thick (8.1 x 8.1 x 2.5CM.) At that size, I would expect more capacity. The disparity between the high list price and the Internet price is a surprise. A wireless watch charger isn’t a necessity unless you are camping away from a power source, but having a battery pack to charge up all of your devices when you travel is always a good idea. MyMac Reviews rating is 7 out of 10.